The invitation was on creamy stationery with fancy calligraphy: The Permanent Representative of the Islamic Republic of Iran "requests the pleasure" of my company to dine with H.E. Dr. Mahmoud Ahmadinejad. The dinner is at the Intercontinental Hotel  with names carefully written out at all the place settings around a rectangular table. There are about 50 of us, academics and journalists mostly. There's Brian Williams across the room, and Christiane Amanpour a few seats down. And at a little after 8pm, on a day when he has already addressed the U.N., the evening after his confrontation at Columbia, a bowing and smiling Mahmoud Admadinejad glides into the room. This is now an annual ritual for the President of Iran. Every year, during the U.N. General Assembly in New York, he plots out a media campaign that  in its shrewdness, relentlessness, and quest for attention  would rival Angelina Jolie on a movie junket. And like any international figure, Mr. Ahmadinejad hones his performance for multiple audiences: in this case, the journalists and academics who can filter his speech and ideas for a wider American audience. The format of the evening is curious. In his calm and fluent voice  "dear friends," he calls us  he requests that we not ask questions, but make statements, so that he can react to them in a form of dialogue. The academics are not shy. They make statements not only about the need for dialogue and reconciliation, but castigate the Iranian government for chilling press freedoms and for arresting Iranian-American scholars who were only trying to foster better relations between America and Iran. Throughout, Ahmadinejad is courtly, preternaturally calm, and fiercely articulate. After an hour, he is ready to respond. He does so first with a half-hour ode to the relationship between man and God that might have been dictated by the Persian poet Rumi. "I believe that Almighty God created the universe for mankind. Man is God's most important creation and it is through him that we appreciate the beauties of the universe. God has sent man here on a mission." That mission, he says, is to pursue love, justice, kindness and dignity. In fact, he repeats those works so often that it begins to sound like a mantra: Love. Justice. Kindness. Dignity. He speaks with the quiet zeal of a not-very-flamboyant televangelist. "The pursuit of justice through love and kindness and human dignity can end all conflicts on earth," he says. "Inshallah." 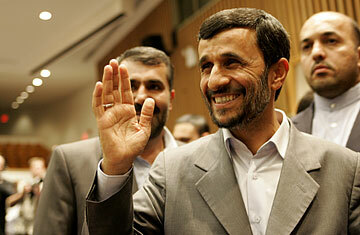 - Iran has not violated any of the rules of the International Atomic Energy Agency, Ahmadinejad says. He has proposed a multilateral uranium enrichment program with different nations, and can't understand why no one has taken up his offer. - The U.S. and Iran can play a positive role together in Iraq. "If the U.S. withdraws from Iraq, good things will happen," he says. "I believe that the Iraqi people can rule themselves." - In the Middle East, Ahmadinejad says the world must allow the Palestinians to decide their future for themselves: "That is the human solution to sixty years of instability." He refers to Israel only as "the Zionist regime" and does not mention the Holocaust. - Ahmadinejad claims there are thirty newspapers published in Iran that are opposed to his government, citing that as evidence of press freedom in Iran. - In answer to a question about how he viewed Hitler's legacy, he says, "I view Hitler's role as extremely negative, a despicably dark face." - He notes that Americans don't understand Iranian history, saying that the movie 300  with which he seems intimately familiar  was a "complete distortion of Iranian history." Iran, he says, has never invaded anyone in its history. Finally, in response to a question about whether war with Iran was growing more likely, he says, "Mr. Bush is interested in harming Iran. But I believe there are wise politicians in America who will prevent such a war. We hate war. We would not welcome it. But we are prepared for every scenario. Yet I don't think war will happen." With that, Ahmadinejad says he has an early morning appointment the next day, and that he welcomes greater dialogue like this evening. And then, still composed, and with the same slightly mysterious smile that never leaves his face all evening, he bows deeply and heads upstairs.